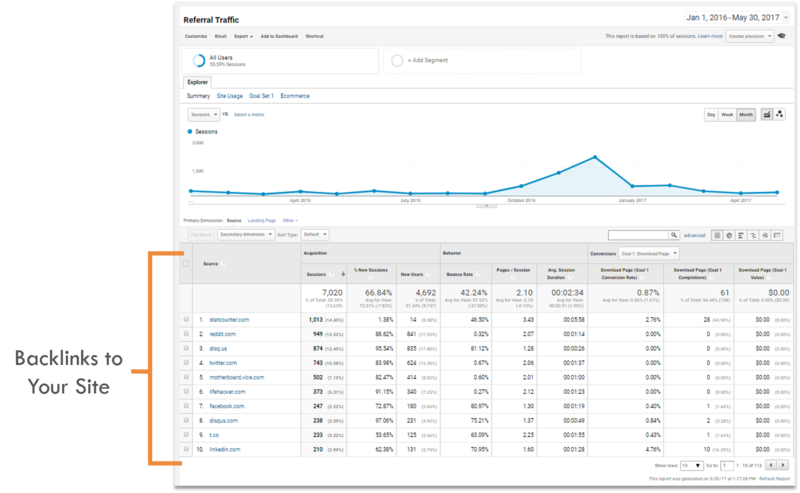 You can use Google Analytics to track your site’s backlinks. And you’ll learn how in this simple three-step guide. But in Google Analytics, backlinks are called referrals. So this is what to look for. So with that in mind, here’s how to check backlinks in Google Analytics. And if you’re looking to check backlinks like a ninja, part two of the guide dives into advanced techniques. So stick around and learn how. 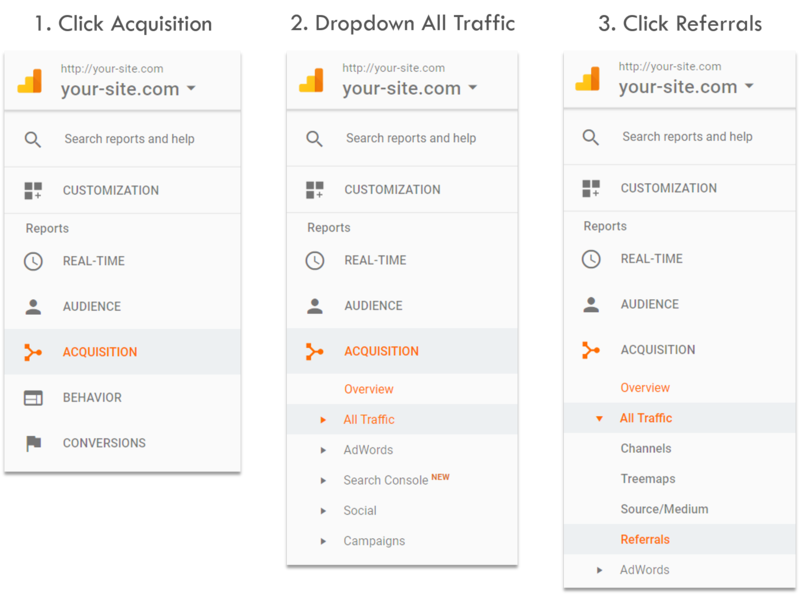 Check to see if you’re using the correct Google Analytics accounts, profiles, and views. 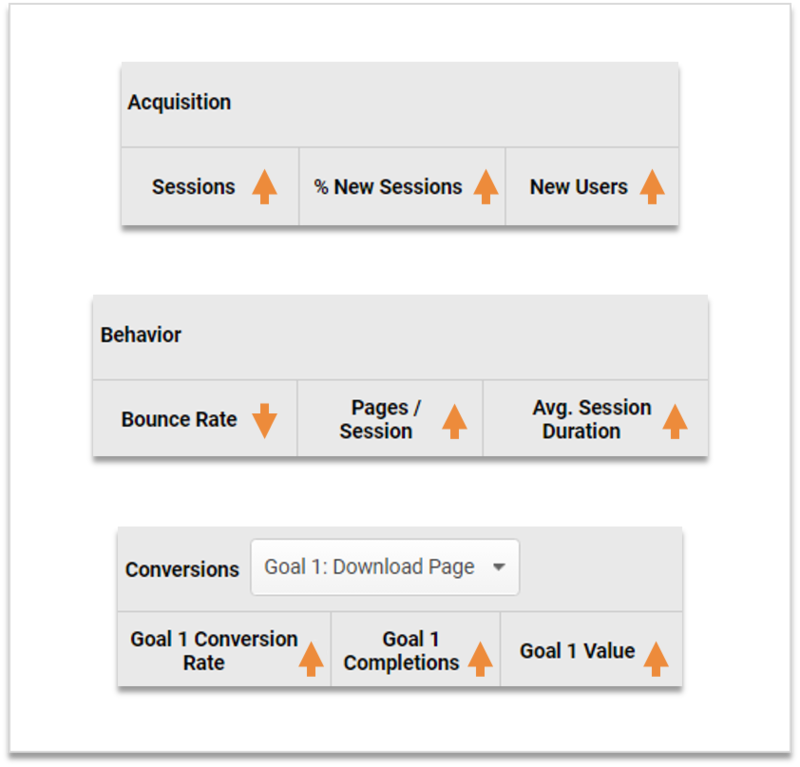 When you login into Google Analytics, you’ll see the site you’re analyzing in the top right hand of the page. Drop down the menu and select the correct site. Google categorizes backlink traffic under “acquisition” data. So here’s how to navigate to your backlink report. Click “Acquisition” in the left-hand menu. This will drop down all acquisition reports. Then, click the “All Traffic” drop down. The referral traffic report is where your backlink data lives. You now know how to check backlinks in Google Analytics. Keep reading to learn advanced techniques for checking backlinks. With the basics now in the books, it’s time to start having fun. Here are a few advanced techniques you can use when checking backlinks. Start slicing and dicing your backlinks using audience segments. This technique breaks down different visitor “types” coming to your site through backlinks. 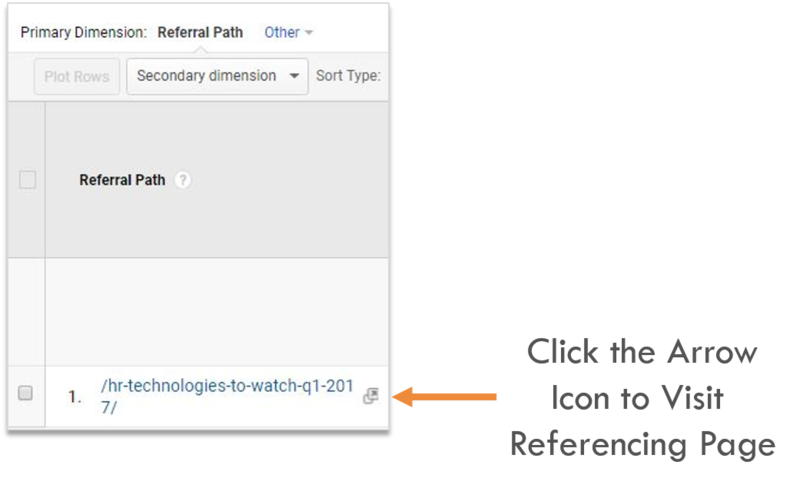 First, click “Add Segment” at the top of your Referral Report. This will open audience segment options. Then, use the search box to find specific audiences. You can also browse through the list of audience segment options. But if it’s your first time, give “new users” a try. Make sure to click “Apply”. This saves your audience segment. Now you’ll see the percentage of traffic from your new audience segment. And you’ll also see comparative data throughout the report. Audience segments paint a picture of your backlink visitors. For certain audience segments, you won’t see any data. For example, organic traffic. Because that audience is also acquisition traffic. So if you’re not seeing data for certain audience segments, it’s not a problem. 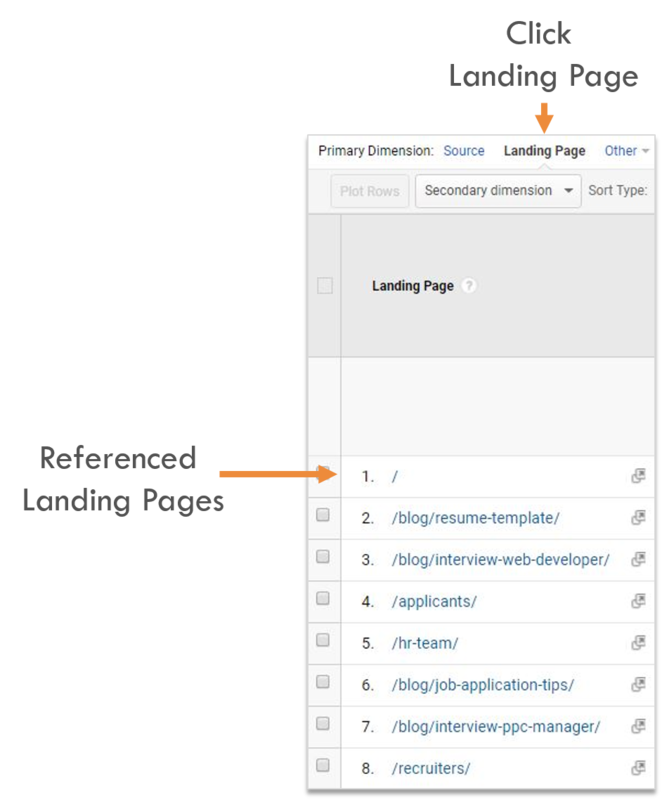 Use primary dimensions to see backlink sources and landing pages receiving backlinks. The default primary dimension is “source”. 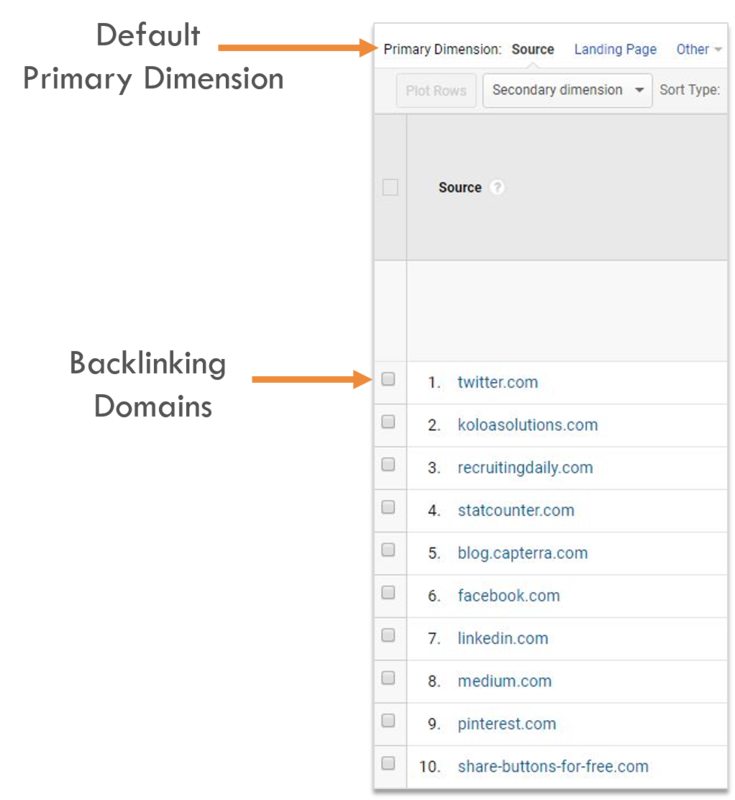 This shows you the backlinking domains. So now to actually see the backlink page, click one of the domains. This shows you the referral path. You can then click the arrow icon and visit the actual page referencing your site. After checking backlinks, also have a look at which landing pages are getting references. Clicking “landing page” in the primary dimensions tab. Now use the data tables to see which backlinks and landing pages are performing well. Look at your acquisition, behavior, and conversion data. You want to see all these metrics trending upwards. Except for bounce rates. The lower the bounce rates, the better. Using advanced filters you can dissect your backlink report even more. I like to use advanced filters to bubble up high performing backlink sources. Here’s how to use these filters. First, click the advanced filter link. This drops down filter options. 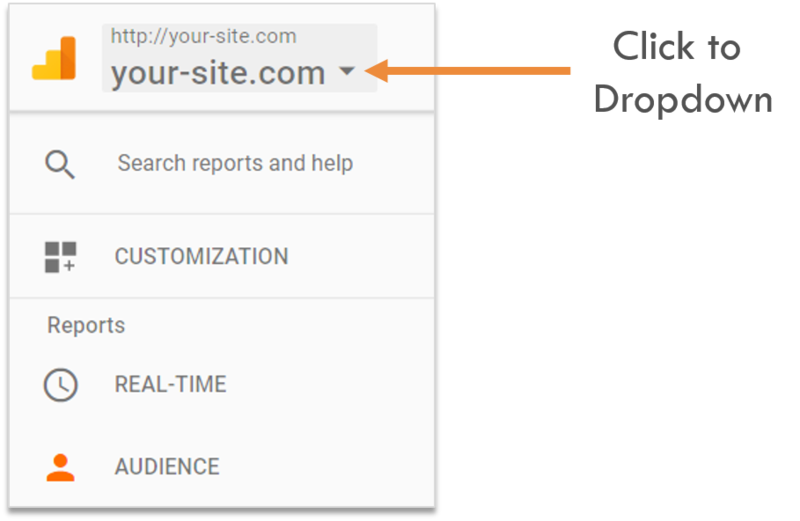 Now click the Dimension / Metric Dropdown. Here’s where you can select how you want to dissect your data. For this tutorial, I want to focus on backlinks giving me high-performing behavior metrics. 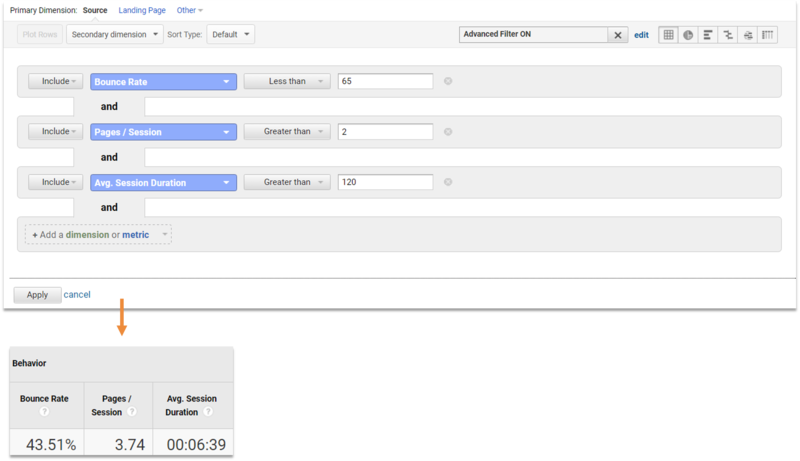 Because I only want to see behavior metrics, I have to set filters to “include”. Next, I’ll find behavior metrics using the search box or by sifting through dropdowns. But here’s where it gets a bit tricky. Make sure you’re using your less than / greater than options properly. For example, because we want to backlinks that give us good bounce rates, we’ll want to set a “bounce rate ceiling”. In the image above, you can see I set my bounce rate ceiling to 65%. This means I only want to see backlinks generating a 65% bounce rate or lower. …And voila! 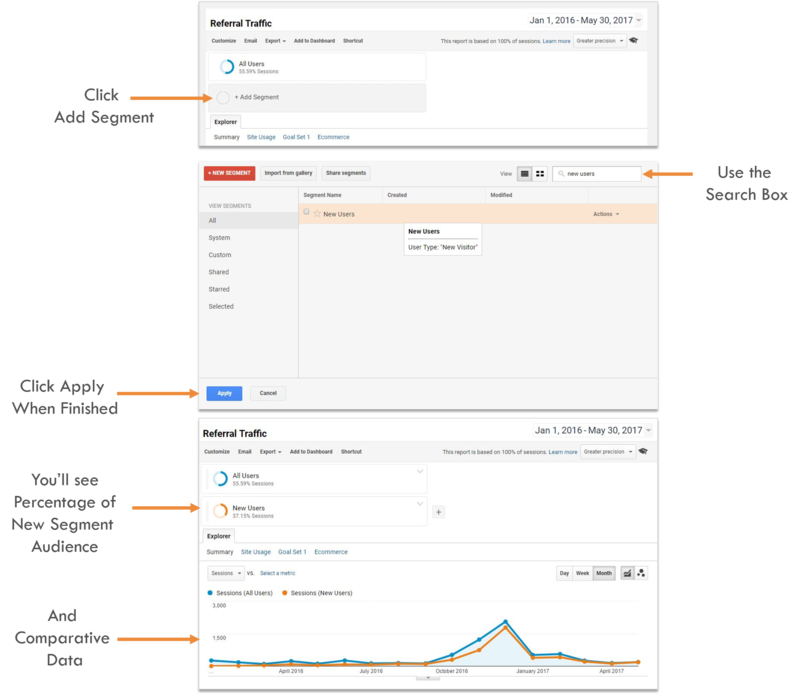 Google Analytics will now only show backlinks meeting all these performance marks. Have some fun and play around with your advanced filter options. If you’ve made it this far into the post, you’re serious about backlinks. And that’s good because backlinks are a major ranking factor in search engine algorithms. But why? It’s because they act as a reference from online communities. So moving forward, here are a few tips to keep in mind when building backlinks. Backlink quality matters. 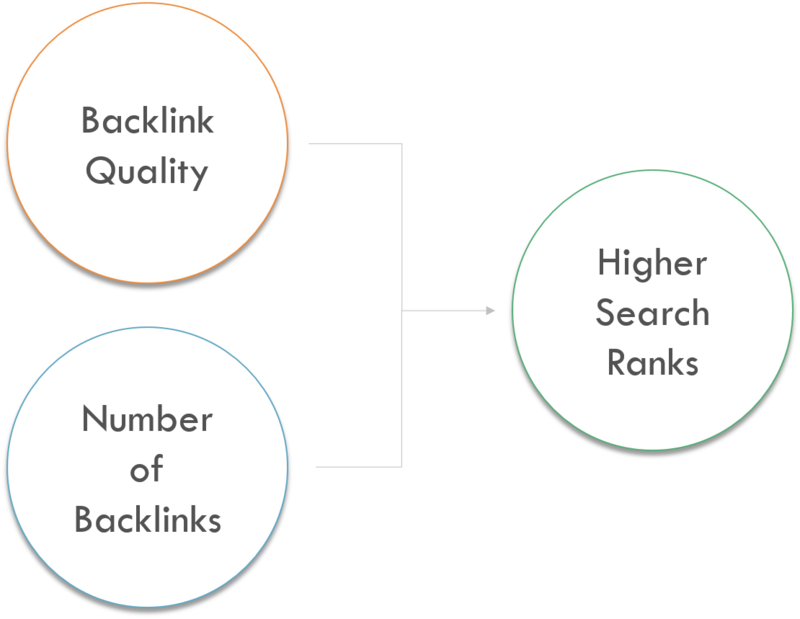 Quality backlinks are references from domains with high authority. These are sites like BBC, Huffington Post, or Mashable for example. Also aim for high volumes of backlinks. It’s awesome to get a few high-quality backlinks to your site. But a majority of backlinks will come from domains with lower authority. And that’s okay, because the more domains that link to your site, the more references you have from online communities. And search engines will take notice. Now you know how to check backlinks in Google Analytics, techniques for high-level analysis, and factors behind backlinking. But don’t stop your quest to becoming a backlink ninja now. Here are a few additional resources you can use to learn even more about backlinks. 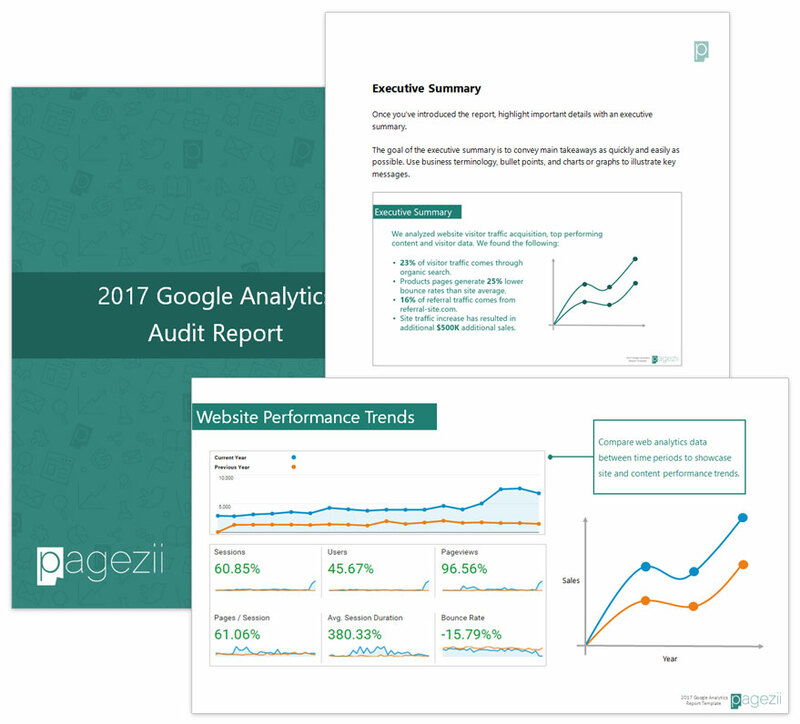 And for more Google Analytics tips and techniques, make sure to download our Google Analytics Audit Report Template for Digital Marketers.